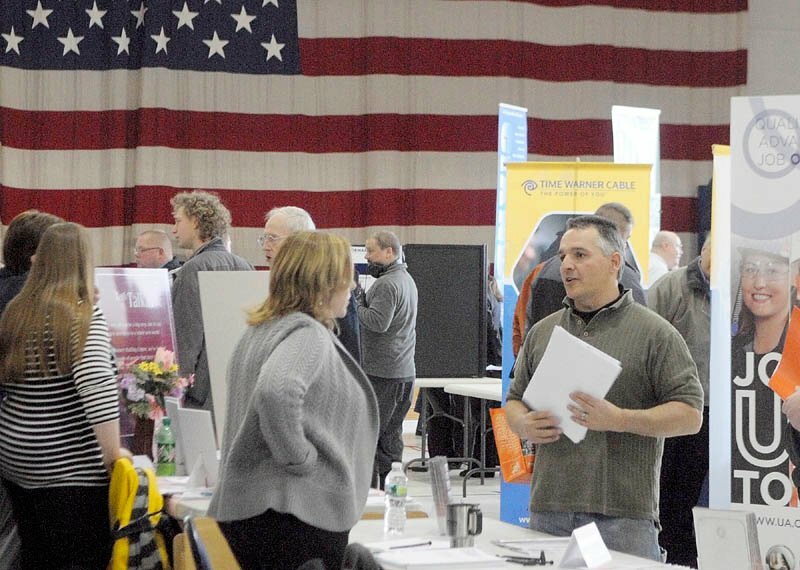 Maine's unemployment rate continued to fall in May, to 6.8 percent, the lowest rate since November 2008, according to a U.S. Department of Labor report issued Friday. Maine’s unemployment rate continued to fall in May, to 6.8 percent, the lowest rate since November 2008, according to a U.S. Department of Labor report issued Friday. The preliminary estimated jobless rate was below 7 percent for the second month in a row, after more than four years in which it was at or above 7 percent. In April, Maine’s estimated unemployment rate was 6.9 percent. The U.S. Department of Labor Statistics estimated that 48,200 job seekers in Maine were unemployed in May, a decrease of 3,600 from May 2012, when the state’s jobless rate was 7.3 percent. May’s estimate of 600,400 nonfarm payroll jobs was up 2,400 from the revised April estimate. The job growth has occurred primarily in the hospitality, professional services, health care and education sectors. Other sectors generally have stabilized since the nation’s economic downturn. As the number of private sector jobs has slowly increased, the gains have been offset by losses in the number of government jobs. Government accounted for 16.6 percent of non-agricultural jobs in May, the lowest share since 2001. Maine’s unemployment rate remains below the national rate. In May, the U.S. jobless rate was estimated at 7.6 percent, down from 8.2 percent a year earlier. However, the figures for Maine could be adjusted upward next March, when the labor department will release updated, more reliable data for 2013, said Glenn Mills, chief economist for the Maine Department of Labor. Still, he noted that the long-term trend in Maine since 2011 has been toward a stronger job market. Some Maine businesses, particularly in the service and hospitality industries, are in the midst of major seasonal hiring that repeats itself every summer. Bangor-based Lafayette Hotels, which owns and operates 25 hotels and resorts in Maine, generally increases its staff from about 700 in the winter to 1,300 in the summer, said Chief Operating Officer Peter Daigle. Daigle said it can be challenging to fill the company’s staff with qualified candidates, despite regularly returning workers and the availability of students in the summer. Daigle said he hasn’t heard any complaints from the company’s hotel operators this year about difficulty finding candidates. “We seem to be doing OK,” he said. Gov. Paul LePage said in a press release Friday that continued improvement in Maine’s jobless numbers is a sign that his policies are working. “Today’s report that Maine’s unemployment rate is below 7 percent for the second consecutive month is a positive sign that our economy is slowly recovering,” said LePage. “We must continue to make the tough choices on taxes and right-sizing government that will further improve our business climate and kick our economy into high gear. “Making the state competitive in terms of taxation and the environment in which to grow a business is the formula that will create jobs and provide the opportunity that encourages young people to stay and others move here,” LePage said. In recent months, Maine’s jobless rate has fallen slower than that of the nation, but Mills said the reason is actually positive for Maine. Nationally, a higher percentage of job-seekers have given up looking, so they are no longer counted as part of the workforce, he said. “Declining labor force participation drove U.S. unemployment rates lower, a trend that did not occur in Maine,” Mills said. He said May was the 68th consecutive month in which the percentage of employed Mainers was larger than the percentage of employed Americans — 60.9 percent to 58.6 percent. However, Mills said, economic indicators such as gross domestic product, personal income and jobs indicate that Maine is among the slowest-growing states. Mills said the decline in Maine’s population from age 25 to 54 will be at its most severe from 2010 to 2015, averaging 7,700 per year. “As a result, we should not expect Maine to be among the faster-growing states,” he said.